I don't drink the cocktails, of course, but I like them anyway. I like the sweaty short fat glasses that look so sure of themselves and smug, their little swords impaling the glossy maraschino cherries gleefully. I like the graceful martini glasses, too, with the smoky olives lurking in their depths, or the tiny onions. "Like eyeballs!" she said once, and I agreed with her. After that I was happy that she didn't drink the ones with the onions. Sometimes he makes her one of the short fat ones even before they leave for the party, when she's running around in stockings and no shoes, putting her earrings in while trying to find her favorite lipstick, which she was sure was in the pocket of her coat, but which usually turns out to have been left in the car. On the way they don't usually listen to the radio, but when they get to the parties there's always music. I like that man with the sad voice the best, but I like the dancing songs, too. She's a good dancer, and she knows how to use me when she dances, how to make my skirt swirl just so. I especially like that moment when the dance has just stopped but she's still standing there in somebody's arms. Usually they're his arms, unless there's a card game starting up, and then it could be anyone. I like him the best, but there's another one, Bill — he's a very good dancer. Sometimes, when they're dancing, he whispers into her ear. I can't hear what he says but I can hear what she says back. "Oh, Bill, you're terrible!" is what she says, but she doesn't sound upset. She's usually laughing. I like seeing the other dresses, too, although of course we don't really talk. It's more like a series of little nods; I might nod to Alice's black crepe, as if to say "nice seeing you again," (although of course you see her everywhere, she really deserves a rest). I might give a little acknowledging nod to a new dress; there's usually at least one new dress at every party, and the new ones always get the most scrutiny. Everyone wants to make sure the fashion hasn't changed so much that their wearers will think they've become dowdy. I'm not one of the oldest, but I'm not one of the newest, either. I hear from her other dresses that sometimes the ones that have been to too many parties here go to her sister in Baltimore. I'm not sure where Baltimore is, but I hope they have parties. They must, or why would she send her dresses there? I don't want to go anywhere that doesn't have parties. Sometimes unexpected things happen at parties — there was the time that Gerry decided he didn't want to wear pants, for one. (I always wondered what the other suits thought about that, but of course we hardly ever talk to them, even when we share a closet. They're so uncommunicative.) Once she walked in on Phil and Amelia in the spare room. I thought they were dancing, but it seemed odd for them to be dancing so far from the music. Amelia's dress was all askew, too. It wasn't hanging right at all. And I'll never forget the time, at Harold and Pat's Christmas party, when Pat brought out that flaming dessert and the dangling ball fringe on her party apron went right up, just whoosh! Harold had to squirt her with the soda siphon. Luckily her dress was okay, it was a bright red polished cotton. I don't think cottons make very good party dresses, but maybe that's why Pat went all-out with such a fancy apron. After that party, on the way home, she laughed so hard I thought she was going to split my zipper. On the way home from the parties he holds her hand, and they talk about everyone they just saw. "Can you believe he brought that woman from his office, and the divorce not final?" and "Jeff's not doing well, not doing well at all. Putting on a brave front, though, for Georgia." Sometimes they're quiet, and then I know they're tired, or that they had too many fat little glasses. When we walk in the door her shoes come right off, and her coat goes over the nearest chair. Her earrings land next to her bag on the table in the hall, right by the mail. She whispers hello and goodbye and thank-you to the babysitter. Sometimes she and the babysitter yawn at the same time, and that makes them both laugh. The babysitter just lives two doors down, but he always walks her home. As soon as the door shuts again behind them, she rushes up the stairs to his room. First she stands in the doorway for a minute, making sure he's still asleep, that the noise of the door opening and closing didn't wake him. I can see him in the dim light of the bunny nightlight, so I'm sure she can too, but she always goes closer. Sometimes I'm a bit afraid of the little boy; his hands are always so dirty! But I'm safe when he's asleep. She sits on the edge of the bed, and brushes his hair away from his forehead. Every time I see him, he needs a haircut. She always bends to kiss his cheek, something he usually doesn't allow before they leave for the party. His face is slack with sleep, and he doesn't turn away. Then she just sits and watches him. I never thought watching someone sleep would be interesting (I think pajamas are really boring) but watching the little boy is, somehow. Maybe it's just feeling what she feels that's so interesting. Once, I remember, he laughed in his sleep. He must have been dreaming. I'll never forget that sound; it was so beautiful, like something made of crystal suddenly turning into bubbles and floating away. She sits there until she hears the door open. Then she leans over him and whispers "I love you, darling boy," kisses him again, fusses with his covers, and heads downstairs. Sometimes he makes her one more drink, they sit on the sofa, talk a little, but usually she just helps him lock up and turn out the lights, before going to take me off. She always hangs me right up, which is nice. It's not comfortable to spend all night on the floor, especially after a party. I hope if I go to Baltimore her sister hangs up her dresses right away, too. [Edited to change # — this is actually #12, #11 was here. A fabulous story for a fabulous dress. Thanks. Oh Erin, you made me cry before I had even properly woken up…lovely little story. I ran across your site when searching for wedding dresses! I read through all of your stories of the “secret lives of dresses”, great personalities in all of them. I often see dresses in vintage shops wondering who they belonged to and where they were worn. I’ll have to check back to your site, hope to find more stories to read! I’m deeply touched once again, Erin. I love it that the dress feels safe when the boy is asleep. Thank you. What a lovely story, Erin; I especially loved the description of looking in on the little boy. I have a 6 year old, and while he’s awake, he’s a normal 6 year old, but watching him sleeping is the most wonderful thing – he looks like a little angel, just like I imagine the boy in your story looks. you’ve outdone yourself again. Lovely story. Nice ending too. My baby has been living overseas for a year and is coming back home to live. I admit i occasionally sneak in and tuck her in and give her a kiss. she will be 20 in a month but shes still my little girl. Your secret Lives Of Dresses is wonderfully done and well conceived. So sweet! I’ll have to re-read the old ones but this may be the happiest dress story. 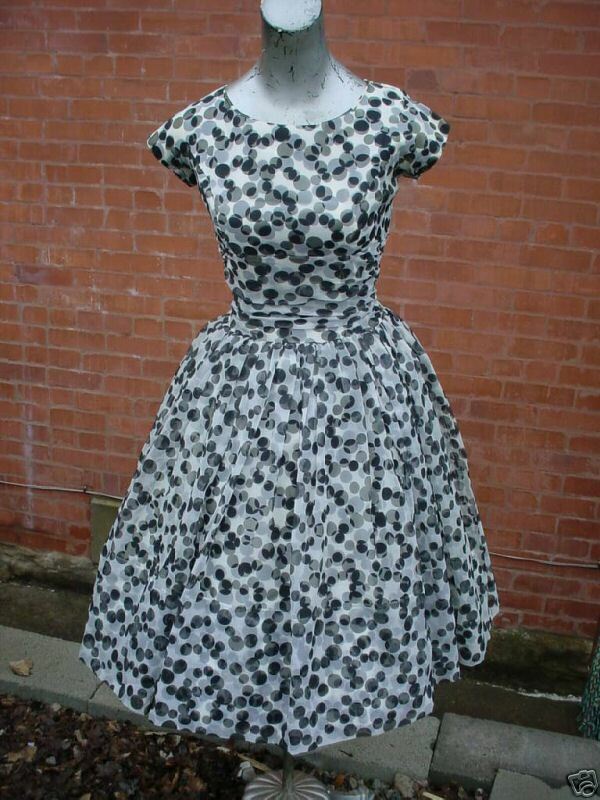 Someone get this dress and take her to a party in Baltimore – maybe chez John Waters, I’m sure he’d appreciate her! BRAVO! BRAVO! CLAP CLAP CLAP! Fantastic! The part about the sleeping boy, the noncommunicative suits, checking out the new dresses! Nothing sad or bad happened. I absolutely loved it! I missed reading them. So nice to have a new one. All positive comments echoed. “Secret Lives” is a wonderful vehicle for storytelling, and you are doing it wonderfully. …big happy tears!…Thanks ever so much for this…and thanks for sharing! This was my favorite one yet. I love the polka dots and the swanky parents’ parties–I have a skirt that looks very much like the dress, in fact–you’ve made the dress so much more complex and tender than at first sight. Beautiful, as always! I wish I lived in a world where grown ups went out in together in nice clothes. It must have been wonderful. I love your stories. I wonder what a book would look like from the perspective of the protaganists clothing. Care to write one? “I always wondered what the other suits thought about that, but of course we hardly ever talk to them, even when we share a closet. They’re so uncommunicative.” What a line! Just wonderful. I really enjoyed the whole story. *happy sigh*This one was lovely. I LOVE these stories…but isn’t this #12? I thought #11 was a lovely, sad little grey and yellow dress last month? This has to be my favourite of your stories, Erin. I love this–story AND dress. I was wondering, was that dress made of layer upon layer of sheer polka-dot, or was the pattern made to look like it (i.e. gray shadow dots among the black ones)? Oh, I do love these stories, they are such an interesting concept. Why didn’t I think of this first, write a book, and make millions? wonderful read as always Erin! thanks! !